Trendy rain coats make gloomy days fun. The sky is the limit for parents looking for unique kids raincoats. These days children can choose designs that make them look like everything from a hungry dinosaur to a colorful butterfly. Three decades ago kids raincoats consisted of basic yellow slickers made from water-resistant plastic. Not only did they lack style and limit mobility, but they also made it hard to tell kids apart. Fast-forward to today, and children can now choose from a wide variety of trendy rainwear that features a myriad of styles, cuts and colors. Hatley's bright and colorful raincoats make dreary days fun. The company carries a variety of girls' and boys' rainwear featuring Curious George, cats, dogs, and flowers. Hatley raincoats for kids also offer a generous cut, which allows children to splash around with ease. 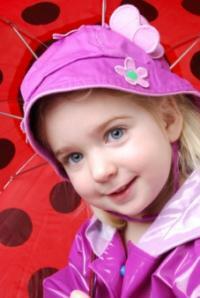 Kidorable specializes in cute rain gear for girls and boys. The company prides itself on its extensive line of raincoats, rain boots and umbrellas, which feature trendy designs, including ladybugs, fish, butterflies and ninjas and firefighters. Kidorable raincoats also include the company's trademark polyester lining, webbing and sturdy plastic buckles down the front. Lands' End is known for making some of the most durable raincoats on the market. Their rainwear for kids features a soft polyester-backed polyurethane shell, which makes it more flexible than traditional raincoats. Lands' End raincoats also feature a hood and reflective piping for higher visibility in heavy rain. Western Chief Kids is consistently chosen as the top pick in children's rainwear by parents and magazine editors. It also helps that the brand is treasured by celebrity parents, who buy Western Chief Kids raincoats in bulk. The company produces matching raincoats and umbrella sets, which can transform an ordinary child into a pretty pony, butterfly, ladybug or rainbow. Adorable raincoats for kids can make April showers a welcome sight, but looking stylish while splashing in monster puddles comes with a price. To avoid having to pay full price for a cute raincoat consider shopping off-season. Most major department stores will place rainwear on the sales rack in late spring/early summer and late fall/early winter. Simply purchase a size larger than what your child currently wears and you will be all set for the next storm. Just remember raincoats often run big, since they are worn over existing outfits. 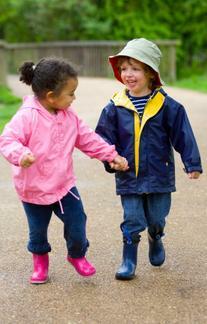 If you are worried about the fit, have your child try on the raincoat prior to purchasing. Another way to save money is to purchase rainwear sets, which include raincoats, rain boots and an umbrella for one price. Not only are these sets money savers, but they also ensure that your child will be well coordinated from head-to-toe. Finally, be sure to read the raincoat's washing instructions before buying. Some rainwear recommends parents to "wipe clean only" while others are machine washable. It's important to read the tag first to avoid ruining your child's raingear.